My calendar disappears after the iOS 8.4 updating, how can I get it back? Calendars lost in the process of iOS 8.4 updating can be retrieved through iTunes backup file. iFonebox even makes it possible to recover the lost calendars selectively and transfer to computer. We use Calendar app to keep track of what we're doing and when, which is why it's one of the core apps on all mobile devices. The Calendar app is included in iOS when it was debuted back to 2007. We keep every important event with the Calendar app, so it would be very depressed if we lose all the calendars. As more and more people choose to upgrade to the latest iOS 8.4 to access Apple Music, data loss complains begin to arise. Some of them are about losing calendar in the process of iOS 8.4 updating. Calendars lost in the process of iOS updating were overwritten and wiped out, and it is impossible to get them back from iDevice like iPhone, iPad or iCloud. Fortunately, there is another way to recover the lost calendars that is recovering from iTunes backup. Acutally, unless you disabled the automatic syn through iTunes, you should have one. It is possible to retrieve the lost calendars by restoring your iPhone, iPad or iPod Touch with the iTunes backup file, but data overlapping and permanent erasing happens. The most secure and simple way is to recover the lost calendars selectively and transfer exported calendars to computer for convenient looking up or record keeping. 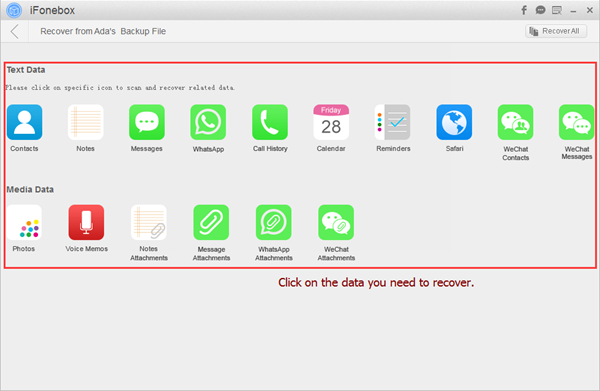 iFonebox, as professional iOS data recovery software, can recover contacts, notes, messages, reminders, voice memos, calendars as well as photos etc from iPhone, iPad or iPod Touch but also from iTunes or iCloud backup file. Therefore it is very convenient to recover the lost calendars from your iTunes backup file of you iPhone, iPad or iPod Touch. You can firstly download a free trial version to have a try but you need to pay for the full version to successfully transfer the exported calendars to your computer. Besides, iFonebox is available for both Windows and Mac. 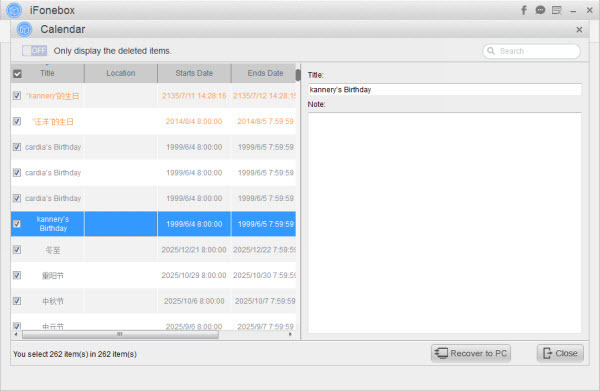 Now we are going to dive into details about how to recover the lost calendars from iTunes backup file with iFonebox. 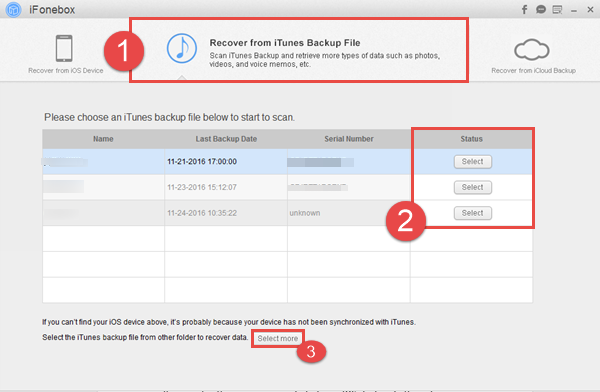 Step 1: Install and run the full version of iFonebox, click to choose the recovery mode of “Recover from iTunes Backup” on the startup interface. And then select an iTunes backup file on the interface asking you to choose one. Note: If you cannot find the iTunes backup file from hte list, you can click the button of "Select more" to locate your iTunes backup file. Step 2: Click the icon for Calendar App to choose the calendars to recover. Step 3: Preview the exported calendars before recovering. You can check whatever you want to recover. Or you can check the box “Only display the deleted items.” to recover the deleted items selectively.